The CO alarms above are examples of units that run off main power. Nighthawk (Kidde), First Alert, and number of other companies are represented in this group. Other CO alarms are powered by batteries, making them portable, but requiring that continued battery life be checked at regular intervals. Some units on the market combine the functions of CO and smoke alarm in one case. Very clever idea ....The Newtron CO alarm, the "Champion Watchdog", is designed to provide CO detection and healthy air for your entire home. 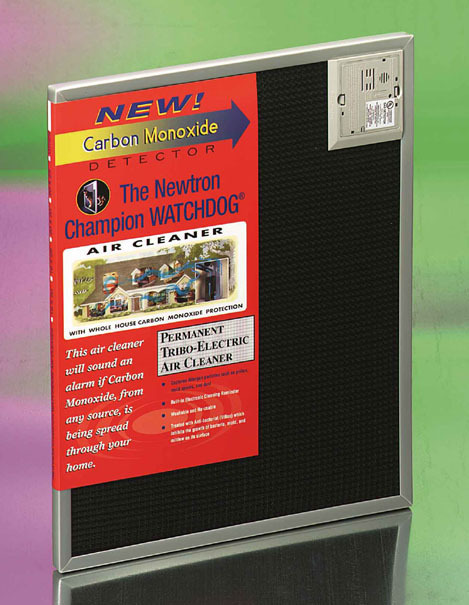 The Watchdog is built into a furnace filter and is uniquely pro-active in that it monitors all the air that is being circulated in your entire home for dangerous levels of CO via the return air ducts. 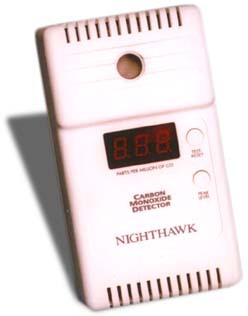 Note: Use of the term "CO Alarm" is preferred over "CO Detector", since the devices commonly available for residential and commercial uses in the protection of the public provide alarm based on simulated human CO uptake, and as such do not give instantaneous read-outs of ambient CO concentration. They should not be used to "sniff-out" CO leaks around furnaces, water heaters, as such. See CO MONITORS.